In a an amazing twist, it has being revealed that brother of South Africa Paralympic star Oscar Pistorius is facing charges over the death of a woman in a car crash in 2010. Carl Pistorius, who was present in court over the past week to support Oscar, is charged with culpable homicide over the alleged accidental death of a female motorcyclist. 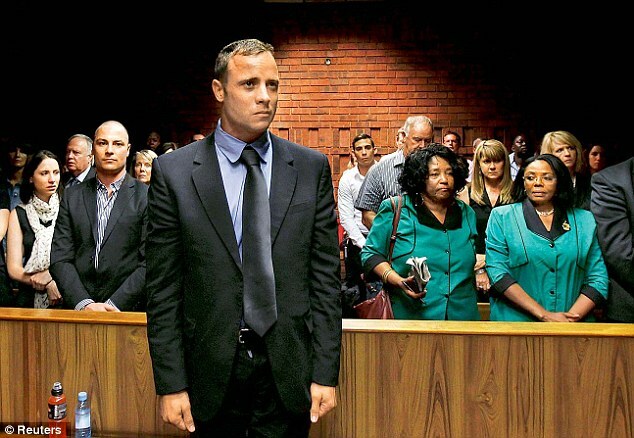 His lawyer, Kenny Oldwage, who also represents Oscar Pistorius, has confirmed the charges. Carl Pistorius appeared in court just two days before his brother's bail hearing last week. Mr Oldwage is a highly-respected advocate in South Africa who successfully defended Sizwe Mankazana, who was charged with culpable homicide, reckless and negligent driving, and driving under the influence of alcohol after he lost control of his vehicle, killing Nelson Mandela's 13-year-old great-grandchild Zenani in 2010. It has also emerged that Oscar Pistorius sported a mysterious black eye in a video filmed a month ago for a charity campaign. The Paralympian lent his support to a South African ­campaign for gay and lesbian youth. But charity bosses were surprised when he turned up for filming with a black eye. In the video message recorded to raise awareness for the It Gets Better campaign in South Africa, Oscar instructed young people who were being bullied about their sexuality to 'not retaliate'. An It Gets Better charity source told the Sunday Mirror: 'Oscar turned up on the day of filming with a very angry ­looking black eye. Oscar Pistorius, meanwhile, spent Saturday at his uncle's home in an affluent suburb of Pretoria, the South African capital, after a judge released him on bail on Friday. Oscar Pistorius has been charged with premeditated murder in the shooting death of his girlfriend Reeva Steenkamp in the early hours of Valentine's Day. But the athlete denies murder, saying he killed her accidentally. He says he opened fire after mistaking Miss Steenkamp for an intruder in his home. Today, it emerged police have told her family that Pistorius crushed his girlfriend’s skull with a cricket bat before shooting her dead. Details of the post-mortem examination of South African model Steenkamp were withheld from last week’s bail application hearing. But grieving relatives who saw her body before Tuesday’s cremation in Port Elizabeth described horrific injuries from the cricket bat, and entry wounds from 9mm bullets fired by Pistorius. They were also briefed about the model’s death by police and lawyers from the state prosecutor’s office. The bloodstained bat, which is currently being examined by a police forensics team, will be key evidence when Pistorius goes on trial for premeditated murder. The ‘Blade Runner’ – who has previously boasted about having a cricket bat, pistol and machine gun at home to defend himself against intruders – claims the bat became blood-spattered at the scene. Last week the prosecution did not mention any details about the bat and the role they believe it played in Reeva’s death, opting not to disclose their case against Pistorius. But to secure bail, Pistorius’s legal team had to detail his defence, which included why he had a blood-spattered cricket bat in his possession on the fatal night. The athlete claims that during the night he heard a noise in the bathroom and feared it was an intruder. Pistorius, 26, said he felt ‘vulnerable’ without his prosthetic legs, so he got a gun from under his bed and fired through the bathroom door, shouting at the ‘intruder’ to get out of the house and for Reeva to call the police. At that point Pistorius thought she was still in bed. Pistorius described his ‘horror and fear’ as he realised Reeva was not in the bed, and said he used the bat to break down the toilet door to find Reeva slumped inside the cubicle. He said he called paramedics and then carried Reeva, 29, downstairs, trying to revive her, but she died in his arms. 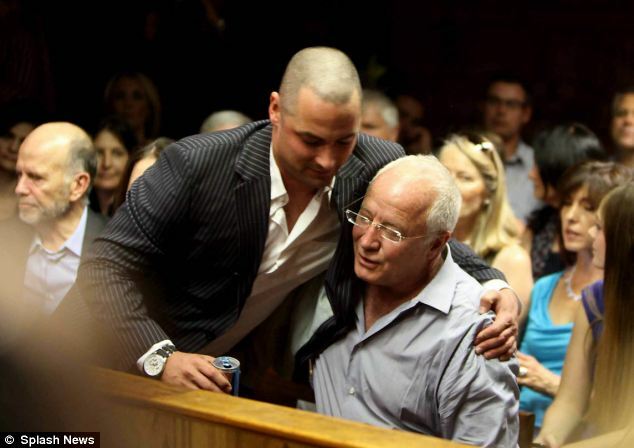 Yesterday, Reeva’s father Barry Steenkamp said that the athlete would have to ‘live with his conscience’ if he is lying about how he killed her. He told Afrikaans-language newspaper Beeld: ‘It doesn’t matter how much money he has and how good his team of lawyers is, he must be able to live with his conscience if he allows his team of lawyers to lie on his behalf. ‘When you are a sportsman, you act even more on instinct. It’s instinct, things happen and that’s what you do. Having been released from bail after the gruelling four-day hearing, Pistorius was yesterday spending the day with his family at a secret address in Pretoria provided by his legal team. If his athletics coach Ampie Louw has his way, Pistorius could be back in training at the track at the University of Pretoria. He was last there earlier this month with Reeva, who watched admiringly as he was put through his paces. Friends have spoken of the need for a suicide watch on the sportsman as he spends the next four months preparing for his court appearance on June 4. Meanwhile, South Africa’s top detective Lieutenant General Vinesh Moonoo is taking over the role of chief investigator in the case, after Hilton Botha stepped down from the post. Detective Botha resigned after seven charges of attempted murder against him were reinstated. He and three other officers shot at a minibus of escaping murder suspects in 2009.